Seating Layout 5 cars each seating 6 guests, 3 rows per car, 2 guests per row. The refurbishment has been pushed back from March to late April. Love Big Thunder Mountain Railroad it's always fun to ride this coaster. I wish Disney World would build another Big Thunder Mountain Railroad. The New expansion would help Disney maintain the original ride help reduce waiting times also. While enhancing Frontierland's Experience even further. Disney should also do the same with Splash Mountain,& Adventureland. Walt Disney always wanted His Parks to continue to Expand & Grow with Endless Imagination. As the old saying goes Build it & they will come. I love this ride so much! We have been going for years and this is always a must! It is a very rare thing for us to not ride this more then three times! I love how the coaster is more tame which makes it a different type of thrill from things like Space Mountain. I love riding and seeing the mountain and the other stuff. The other reason I love this ride is because of the detail that was put into this ride. I swear Universal does not have a coaster detailed like this! The only thing I hate is that they have taken away the special effects from the ride. I mean I understand the safety concerns, but to me there are better ways to protect guest without removing the effects! But we still love it, and we will always love it! My girlfriend loves roller coasters. She had never been to WDW and wasn't sure how much she would like it compared to coaster parks, although she was intrigued. Well, despite my best attempts to prepare her, she was absolutely amazed by every single detail about every single park, land, ride, attraction, shop, restaurant, resort, etc. and she is now a full blown WDW fanatic! Getting back to my original statement; Big Thunder Mountain is now her favorite coaster in the world. She says she has more fun on it than any other coaster type ride she has been on, and we ride it at least a half dozen times on every trip. Big Thunder Mountain is a rollercoaster-type attraction located in Frontierland at the Magic Kingdom. 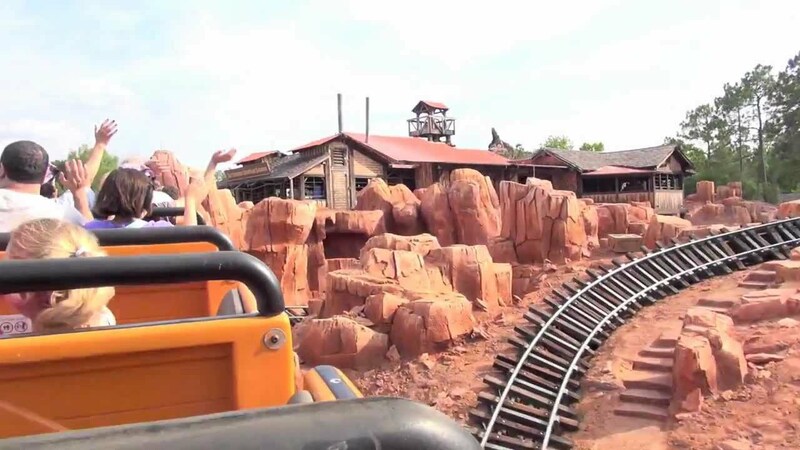 Guests board a mine train at the Big Thunder Mining Co. for a trip through the mountain range. Trains: 6 trains, each featuring 1 engine and 5 cars. Train names: U.B. Bold, U.R. Daring, U.R. Courageous, I.M. Brave, I.B. Hearty, I.M. Fearless. Rider capacity: 6 guests per car gives a total of 30 guests per train. Ride duration: 3 mins 25 seconds. Animatronics: There are 20 Audio Animatronic figures. Voices artist: The spiels for "the wildest ride in the wilderness" were recorded by Dallas McKennon who also provides the voices for Benjamin Franklin in The American Adventure.